Located on the second floor of the Queen’s Quay Terminal, Pearl Harbourfront has been on my radar for much longer than a year now. 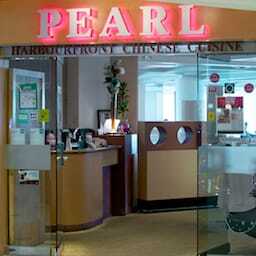 You can’t have a conversation about the best dim sum in Toronto without Pearl Harbourfont being mentioned. In the same class of restaurants as Crown Princess and Lai Wah Heen, Pearl Harbourfront has an excellent reputation and their dim sum is highly regarded by many. I had never been to Queen’s Quay Terminal before, but two weeks ago I finally made my first visit to Pearl Harbourfront. The restaurant is on the second floor next to a small food court and was very easy to find. The elevators were under renovation when I went so I had to take the escalator up to the second floor, but it gave me the opportunity to admire the decor and architecture of their ceiling. I looked over the entire dim sum menu very thoroughly while drinking Tea ($1.75) before picking some pretty standard dim sum items, for comparison sake, as I always do when reviewing a new place. I’ve heard mention of their "hockey pucks" dim sum specialty, but I never saw it on the menu and I forgot to ask about it or I would have ordered it. The Crispy Shrimp Rolls ($5.80) was the first of six dishes to arrive. They were full of shrimp and very tasty but not anywhere as good as the ones they serve at Rol San, and they had noticeably more "filler" than even those you get from Tremendous Chinese Restaurant for half the price. Even still, it was a good start to the meal. The scallops atop the Fried Taro Stuffed With Scallop ($3.80) were very fresh, perfectly pan-seared and exceptionally delicious, but unfortunately, the rest of the dish was not so great. While scallops were indeed a very prominent feature of the dish, they were on top of a very crispy stuffed taro, not inside the taro. More than just misplaced words though, the real issue I had was with the stuffing. While there aren’t many things I’m not open to tasting, I can’t stand curry and the stuffing in the taro had a very generous helping of curry. The curry, ground meat, mushroom, onion and barbecue-pork stuffing was overpowered by the starchy taro though, so while I was able to stomach the curry enough to get a good taste of everything, I also couldn’t help but notice just how off-balance the whole combination was. Perhaps there was just too much taro for the amount of stuffing? But then more stuffing would have meant even more curry… Hm. Apart from the fact that the Siu Mai ($5.80) had both ground pork and shrimp inside, (not just ground pork like at some cheaper dim sum places), the Siu Mai were very average and nothing spectacular. I thought the green pea was an odd choice of garnish – nothing like the goose liver and caviar that tops the Siu Mai at Crown Princess – but they were still decent Siu Mai nonetheless. Though the filling in the Steamed Scallop Dumplings ($5.80) had a pleasant texture to them, there was, unfortunately, more carrot, mushroom, shrimp and green onions in them than scallops. More offensive than skimping out on the feature ingredient however, was the fact that the dumplings hadn’t been steamed long enough. You could see dry, uncooked white flour dusting the wrapper edges and the dumplings required a lot of tricky maneuvering to separate from each other, which also brought attention to the fact that none of the dumplings were properly sealed. The Har Gow ($5.80) were packed with shrimp but the taste was plain and very below average. Their binding agent for the shrimp filling (rice flour?) was way too starchy and actually noticeable, something I haven’t encountered in Har Gow anywhere else. They were still palatable and not by any means gross though, just very disappointing for a place like this. The Steamed Beef Tripe with Ginger ($5.80) at Pearl Harbourfront was cut much larger and had a much more rubbery texture than most other dim sum restaurants. The fact that it came way too spicy also didn’t help. (I like spicy tripe, but this was ridiculous!) The texture of the tripe was comparable to rubber bands and required a lot of chewing, which made the excessive heat all the more uncomfortable. The last thing you need when your mouth is burning to the point of needing a liter of tea to put out the flames, is to be stuck in an infinite loop of chewing… Needless to say, I didn’t finish the tripe, which has never happened before, anywhere. While the food at Pearl Harbourfront was quite the disappointment, the service was unfortunately not much better. Once I got my food, the service ended. Never was I asked if I needed anything or checked up on and never did a server come to my table to see how I was doing. (Actually, they occasionally came to clear my table of any empty bamboo steamers, but They’d run off super quick and avoided making eye contact.) What made the complete lack of service all the more pronounced, was the fact that I was seated right next to a waiters’ station where lots of servers were walking by – not once did any server take the initiative to fill my empty tea cup, and for the majority of my meal, they had their backs turned away from me while they chatted up a storm with each other. The service at Pearl Harbourfront started on the right track – I was greeted and seated very quickly after all, but once my food arrived I was left to fend for myself. There’s never a good excuse for this – the restaurant was not even a quarter full and looked over-staffed if anything – it just comes down to a lack of respect for their customers. The modern and clean look of the restaurant’s decor is similar to that of Lai Wah Heen and all the servers were in uniform vests and ties, though I don’t think the servers at Lai Wah Heen would get away with black jeans in place of dress pants. It was also hard to ignore that the carpeted floors were very old and in dire need of replacement. On the subject of value for money, I also found their pricing to be all over the place. Apart from the fact that a lot corners were cut with the quantity of the feature ingredients, none of their prices seemed to correlate with the market prices of the ingredients used. Most notably, how is it that the taro dish, which came with two large, seared scallops was the least expensive dish? And why was the steamed beef tripe – a dish made with super cheap ingredients that requires relatively little labor – priced exactly the same as the more labor-intensive and higher ingredient-cost steamed scallop dumplings? It explains why the dumplings had more filler ingredients in them than scallops, but it doesn’t explain the tripe being priced the same as the shrimp rolls, siu mai and scallop dumplings… The truth is, I never look at prices when ordering dim sum (I just get what I want), but the fact that I even looked at the prices on the final bill is probably indicative of my satisfaction with my experience at Pearl Harbourfront. Though my first visit to Pearl Harbourfront was a big let down and not an experience I’m going out of my way to repeat anytime soon, I can still see the appeal of dining at Pearl Harbourfront, at least for tourists – you can’t beat the gorgeous view of Lake ontario! The seared scallops atop the crispy taro were by far the most memorable part of my meal, but being able to step outside afterwards to take a stroll along the waterfront was unquestionably the best part of the whole experience. Pearl Harbourfront Chinese Cuisine was published on Thursday, November 29, 2012 at 10:30pm EST by Daniel Menjívar and last updated on April 11, 2018 at 9:30pm UTC .